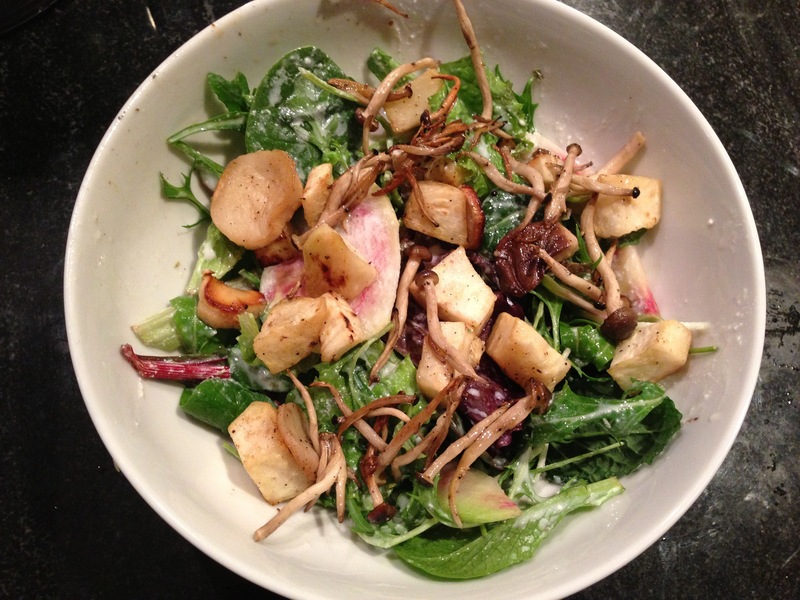 My recreation of a Fore Street salad, with shaved local watermelon radish instead of white turnip, and roasted celeriac and roasted meaty King Trumpets and some enoki-or-shimeji-type smaller mushroom. Delish! I don’t usually run photos this large, but this is an unassuming salad with big flavor. It’s inspired by a truly memorable one I just had at Fore Street, perhaps this Portland’s hottest restaurant. Chef/owner Sam Hayward is Maine’s answer to Alice Waters. My parents took us to his Street& Company on a visit to Maine years ago, but I’d yet to eat at his flagship spot, just above his renown Standard Baking Co., which bakes the chewy fougasse I devoured with my appetizers at Fore Street. Now, Fore Street is famous for its protein, its house-cured-and-smoked charcuterie, fresh Maine seafood and spit-roasted meats. So this simple salad especially stood out. The menu described a turnip and exotic mushroom salad with roasted celeriac and a light buttermilk dressing. Mushrooms on a salad usually stand out as a rare ingredient. I assumed the mushrooms would be pickled or marinated and shaved. But Fore Street is known for its wood-fired cooking. It turns out the mushrooms were quickly roasted, to seal in their juices and concentrate their flavor. How had I, long a slave to mushrooms in the sautee pan, never thought of roasting them before? So I sliced up some locally-cultivated King Trumpets and shimejis (smaller clumped ones like big enokis), rubbed them with olive oil, Maine sea salt and pepper, and into the 450 degree oven they went, along with the cubed celeriac. The buttermilk dressing, with Kate’s legit buttermilk from Maine’s Old Orchard Beach, came from a Vermont locavore cookbook. Recipe to come. It wasn’t hard coming up with my “Meals We Loved” pick for today’s radio show (our second) I taped with fellow Brunswick food writer, Michael S. Sanders. The topic was sustainable seafood. Visit the Table Arts Media page for a soon-to-be-posted podcast of the show. We have a lot of kinks and technical glitches to iron out, but hey, it’s college radio. And as Michael reminded me, James Beard Award-winning chef Sam Hayward’s first restaurant experiment in Maine–22 Lincoln right here in Brunswick–actually went under after a 10-year-run. But, to the delight of diners everywhere, that sure didn’t stop him. How long did you roast the mushrooms and did the celeriac take longer to roast than the mushrooms? Sounds really good – and a little bit different flavors from the usual winter fare. Thanks for asking, Judy! I met mushrooms and cubed celeriac into oven together but did take the mushrooms out first before they crisped up too much. The skinny ones did get a little too dehydrated. I prob roasted the mushrooms 10-15 minutes at 450 and the celeriac about 20-25. But just keep checking it! I’m obsessed with roasting mushrooms now!